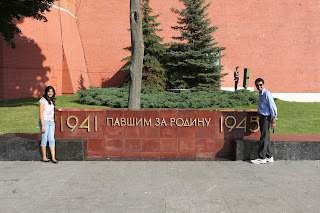 The land behind the iron-curtain has fascinated me for a long time. Be it for the Communist legacy, or be it for the legion of chess champions , or be it for the modern oligarchs who buy off Soccer clubs, Russia seemed to be an enigmatic land. We flew to Domodedovo International airport on a wednesday evening. EK131, a five hour flight from Dubai. Moscow has three airports. This one was quite outside the city. A one hour taxi ride took us to our hotel . Its the olympic hostel of 1980 converted to a hotel. Pretty big complex with all the amenities. Thursday Morning :- We started off to explore Moscow. Started off with a taste of Russian expenses. Couple of sandwiches and tea costed us 300+ Roubles. You would wonder at the engineering marvel of Russian engineers once you see the enmeshed map of metro tracks. Considering that this was built beginning from 1930s, it is really astonishing. Advice 1 : You need a map which has Russian & English names of stations printed. Russian alphabets and language is completely different from English. All display boards are in Russian. And you have to do some serious pattern matching to recognize station names. We surfaces at one of the railway stations near Kremlin. Started of with a small museum ( everywhere, entry fee is atleast 200 Roubles ). 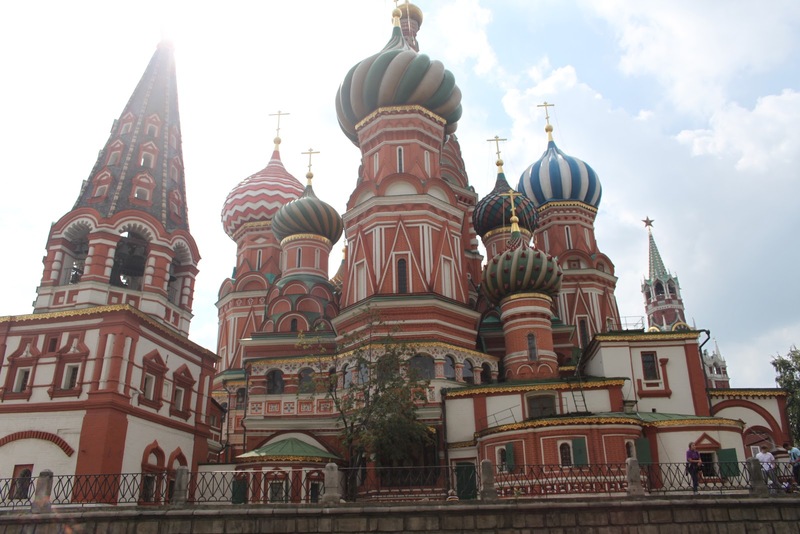 Next was the iconic St Basil cathedral. Nice place for photographs. History dates it back to the 1600's i think. The cathedral is next to Red square itself. You would scarcely see any relics of Communism except Lenin's mausoleum . Exit red square , we were welcomed by these two gentlemen.. And why not, I immediately jumped in for a photograph with them. Realized moments later that nothing comes for free in Russia - 200 Roubles down :( . It doesnt make much sense to pick up a fight with Lenin & Stalin next to Red square .. Isn't it ? Couple of small landmarks next to the area like war memorial, shopping area and some other museum etc were covered then. Advice 2: If you are visiting St Petersburg, its better not to waste money in Moscow museums. The complex housing Russian govt establishments and the old Tsar'ist cathedrals. You need a full day to cover it. Except the arms museum, we covered all places open for visitors. We could not visit the Bolshoi theatre as it was closed. To me, this would be the everlasting image of Moscow . Lenin's body is still kept preserved inside a glass case guarded by Russian soldiers. No photographs permitted there. The reverence with which they guard him even after the fall of communism is commendable. 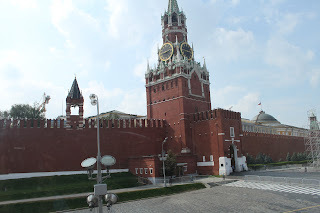 Visited the Moscow city center next to Red square. There were members of Russian Olympic team playing table tennis with the public over there. We did a Moscow boat cruise after that. Apart from a few photographic spots, the cruise was nowhere near the magnificent Bosphorus cruise at Istanbul. We had already checked out that day morning. After spending some more time, we proceeded to Leningradsky railway station for our train to St Petersburg. Maybe because of the beauty & elegance of St Petersburg which we saw over the next two days, In my mind, Moscow left a bit of disappointment.Or, may be I can term it as incompleteness. Either way, those vivid images remain..and will be there for the lifetime.